What do you picture when you think of Japan? For most people the one image that dominates them all is the perfect rocky peak of Mount Fuji. The mountain rears unexpectedly into the sky near Tokyo, towering over everything in all directions. Japan’s most famous art works have exported the majesty of this dormant volcano to the world. This view from the Tokaido Road between Kyoto and Edo is part of the masterful Thirty-Six Views of Mount Fuji by Katsushika Hokusai (find out Where to See Hokusai in Tokyo). 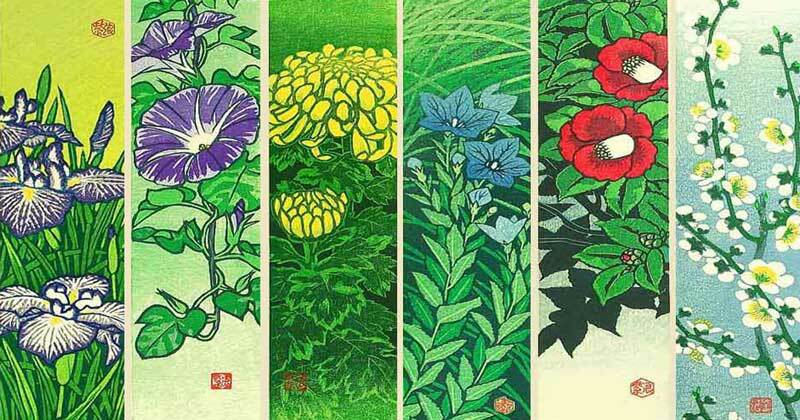 In this selection of Japanese woodblock prints, you can see why the ever-changing moods of Japan’s most sacred mountain continue to capture the imagination of artists right up to the present day. In early spring, glades of cherry blossoms at the foot of the mountain greet the warming weather. For artist Koichi Okada the soft pink flowers provide an irresistible natural frame to this woodblock print from the 1960s. The gentle pastels are reflected in the ripples of Lake Kawaguchi, and the yellow morning light on the slopes illuminate the kindly face of Mount Fuji. The lake is just a short and easy trip from Tokyo, so if you are lucky enough to visit during the sakura season, you can experience such a vision for yourself. Tokuriki Tomikichiro’s view of a cherry blossom season in this 1940s print shows an altogether different perspective. In this image, the more distant mountain can be seen through the gates of the coastal home of Hidetatsu Egawa. Egawa had been responsible for the maritime defenses of Japan in the last years of the Edo shogunate. In this context - standing under a cherry tree, taking in the mountainous symbol of the nation across the southern plains - perhaps the viewer is being invited to consider the value of that which should be defended. 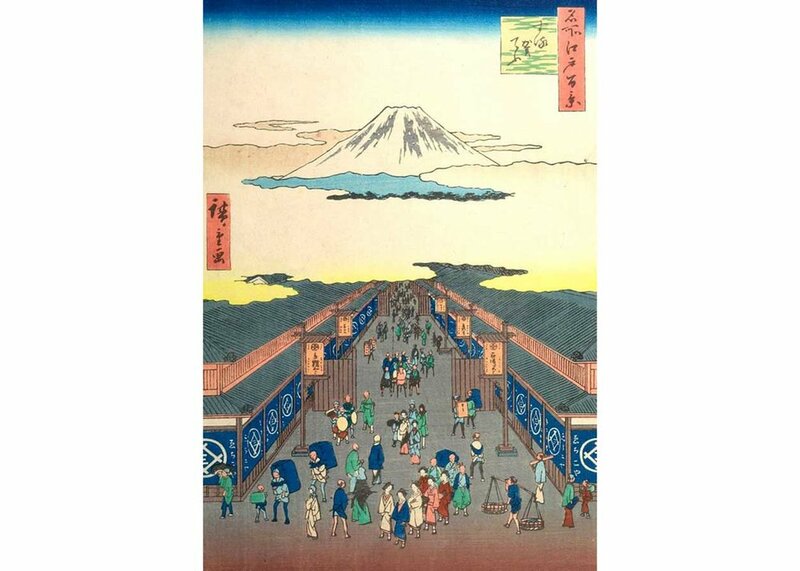 Today the roads around Nihonbashi in central Tokyo are lined with towering office blocks and department stores, but when Utagawa Hiroshige created this print in 1856, Mount Fuji was a inescapable part of the street level view. Clouds obscure the physical distance, and bring the mountain almost into the city, creating the impression that it was not just part of the view, but very much part of Edo daily life. Travelers don't tread the Tokaido road too much anymore, but although paths have turned to freeways, and pylons have shot up across the landscape, the views of Mount Fuji remain just as spectacular. 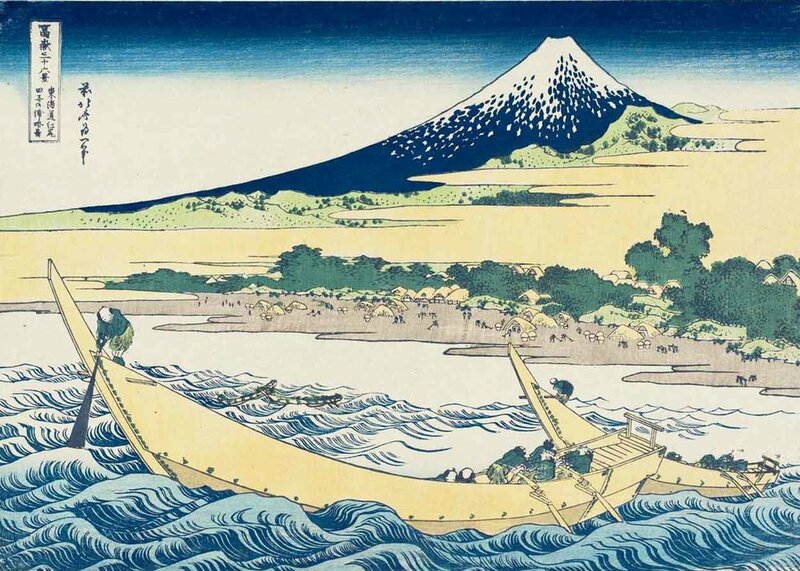 In this 1941 woodblock print from his version of the Thirty-Six Views of Mount Fuji, Tokuriki Tomikichiro captures the scale and majesty of the mountain. As the road curls out of sight, an expansive lake and forested foothills intercede between the viewer and the slopes. Despite the tangible distance this creates, the snow-covered volcano still looms into focus, dwarfing all other details, and vividly expressing Tomikichiro’s sense of awe. Beyond the high-rises of central Tokyo, Mount Fuji remains today in full view of millions both day and night. 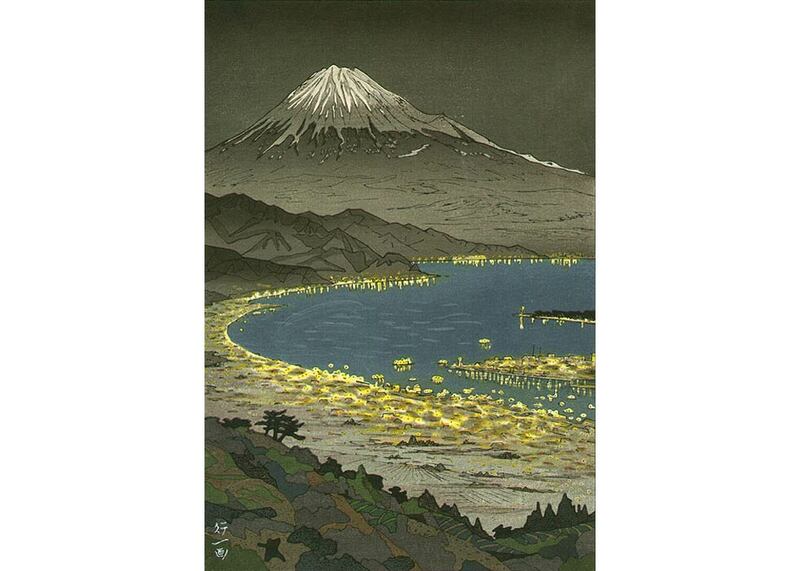 From his vantage point on the coastal hills near Shizuoka, Okada Koichi captured the densely-packed towns around Suruga bay in this 1950s woodblock print. You can still take in Koichi’s view, and without having to make quite the same trek: a cablecar in Nihondaira, near Shizuoka, will whisk you up the 1000ft from the waterside to enjoy the breathtaking panaroma. Sometimes, however, it takes a little more effort to get the best views. 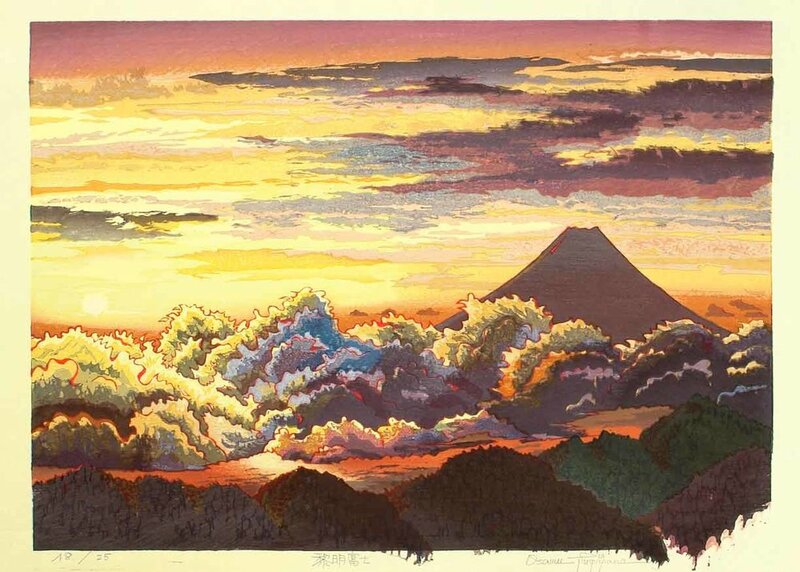 Taking to the hills in the darkness can be difficult, but you may be rewarded with views of the sunrise over Mount Fuji like the one Morozumi Osamu portrays in this wondrous print from 2003. As the mountains in the foreground leak out of the frame, you can sense the artist struggling to contain such a glorious scene within the borders of the woodblock. As the summer days evaporate into fall, the forests surrounding Mount Fuji light up. In this 1950s print Okada Koichi illuminates the vibrant colors of the changing leaves against the dusky rock of the mountain slopes. The scene looking across the placid lake Ashi seems so peaceful, but perhaps there is a warning here too. The circular crater on the eastern flank is a clearly visible reminder of the volcano’s last eruption 300 years ago; so while Mount Fuji sleeps today, one day it will awake again. In the winter, even the lowest slopes of Mount Fuji turn white; at this time only the very brave, or foolish, venture to the top, where temperatures can drop to -20°F/-30°C. The thick drifts of snow create a perfect mirror reflecting the shifting colors of the skies. In this 1932 print by Kawase Hasui, the pink sunlight, which is only a gentle haze on the lower fields, lights up the peak with a rich fiery glow, hinting perhaps at the slumbering fire within. Many of these original prints can be purchased from Artelino.com.